When I was younger I didn’t understand why people would swap out their guitar pickups. If you liked the way a guitar sounds when you buy it, I thought, why change it? It wasn’t until a friend showed up at my studio with a guitar that had some hand-wound pickups in it that I had a revelation. It was quite the eye opener. There were elements of my guitar tone I wasn’t happy with but I couldn’t put my finger on. I certainly didn’t think to consider my pickups. The best I could describe the issue with my guitar’s tone was that it sounded like a blanket was covering my tone. It was dull in a way I couldn’t pinpoint. It wasn’t like there was no presence. The guitar had some bite. But something was masking the tone. This dull or “blanketed” tone is one I now associate with a lot of stock big-box-brand pickups. Let’s take a stock American Strat as an example. By no means is it a cheap instrument. It’s well-made. But its not exactly in the same tone family as a vintage Strat. There are lots of reasons for this, but it’s mainly in its construction. A lot of big-brand products are mass-produced. Making guitars as they were made in the 1950s requires extra labor and extra expense. Modern mass production does one thing quite well: it delivers a consistent product. But it could be argued that mass-produced guitars are too perfect and a bit lifeless. The idea with modern production is to create perfect clones. If each guitar sounded exactly the same, I think it would make the big companies happy as clams in mud. Well, why would you want an inconsistent product? Wouldn’t you want exact copies if you could have them? Here’s the thing. In order to get to the level of refinement and sound that we love in vintage instruments, guitarsneed to be touched by hands. Human hands. Human production is imperfect. But within that imperfection is perfection. Vintage guitars were inconsistent. One 1959 Strat may sound a little different from another. That’s natural. And we shouldn’t be afraid of that. Don’t be wary of the individuality of each instrument. I own two 1991 Fender American Standard Strats. Even though both were mass produced, each is unique. It’s the wood. You can hear it when you play them unplugged. In fact, my first step in testing an electric guitar is whether it sounds good unplugged. If it does, we’re in great shape. Everything gets easier from there. Even if you strap the nicest pickups to a bad slab of wood, it’s going to sound like a nicely amplified piece of driftwood. Luckily, my Strats are not like that. I knew that swapping the electronics was going to be a success. As I mentioned, my Strats suffered from that “blanketed” tone. This became even more apparent to me when Farhad Soheili of FSC Guitars brought one of his hand-built ST-M guitars for me to use at a City Winery gig in NYC. 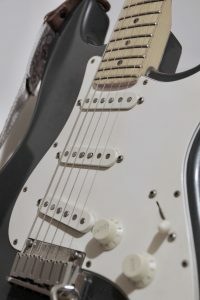 Playing the FSC ST-M against my stock American Strat exposed my guitar’s shortcomings. It wasn’t like I didn’t know. I just hadn’t dealt with it. Well, after that comparison, I had to do something. So I asked Farhad to make me a set of pickups that were like the ones in his ST-M. The Strat-style pickups he uses in that model are based on vintage 1959 Strat pickups. This is Farhad’s favorite era of Strat pickups. They are scatter-wound and use Alnico 5 magnets, Heavy Formvar coils, and staggered pole pieces. Output of the pickups are anywhere from the high 5k to low 6k output range. You can see the output listed on the bottom of my pickups. Farhad calibrates the sets, matching them so that starting from the neck to the bridge, they progressively get hotter. Not a major increase. It’s subtle but effective. This of course happened sometimes in the 50s. But, it was inconsistent because they didn’t intentionally calibrate sets back then. . Farhad is curating the sound. It’s a snapshot from a specific model in a specific era of history. The result is a very articulate and dynamic tone. My fingers feel directly connected to the amp. A lot of mass-produced pickups have that “blanketed” feel, like there’s a glove between my fingers and the guitar. With the FSC ‘59s, the sensation is like direct contact. This changes the way I play. I feel I have more control over my dynamics—the response is faster. To say simply that the FSC ’59s are brighter just doesn’t capture it. Remember, the stock pickups can be bright but still sound inexplicably muted. The ’59s are brighter in a more complex way. There is more presence, but they’re not shrill. They’re not harsh. How is it that a pickup can be brighter and smooth? You wouldn’t normally put those words together. But it’s true. When I first plugged in my Strat with my new FSC ’59 pickups, it was like a sigh of relief. They had a familiar tone. The one I grew up listening to on records. The stock pickups always felt like they needed something more. With stock pickups, I would often pretty quickly plug in a pedal. My FSC pickups don’t need a lot of processing. I’m not saying I don’t use pedals anymore. I still use effects, but to augment my sound—not to compensate for any inadequacies. Within a week of Farhad installing the pickups, I did a tour and a session where that guitar was the main focus. I had been playing the stock pickups on the Strat for over 25 years. Yikes!! That’s some serious time. So the variance was glaring to me. Like I said, it wasn’t so much an adjustment than it was a relief. I struggled less with the instrument. It worked perfectly with my signal chain and amps. It was the tone I was looking for. The secret? Very simply, pickups wound by hand with high-quality parts. For the session, I plugged the Strat straight into a Matt Wells rebuilt Fender tube spring reverb into an early ‘60s brownface Pro with 5881s and a ceramic 15” speaker. This particular amp at Brooklyn Recording is a dream. Fifteens are my fave speaker size. Admittedly, this signal chain is pretty ridiculous. But even with this chain, it’s still won’t be enough if the guitar isn’t dialed in. That’s how it used to be for me. But with the FSC ’59s I didn’t feel compelled to add anything unless I needed a distinct effect. The relationship between the guitar and amp was really great. This makes sense. There weren’t guitar effects at the time this 1962 Pro or ’59-style pickups were designed. It had to sound amazing straight into the amp. By now some of you may think I’m suggesting that stock pickups sound like kangaroo dung. Well, that’s not the case. They sound perfectly fine. Just not superb. Stock pickups won’t prevent you from making great music. But if you could make your guitar feel and sound more responsive, why wouldn’t you do it? Especially when it influences your playing. Gear doesn’t compensate for poor playing or a lack of creativity. But if you’re a good, creative player, great gear can make all the difference! I wouldn’t say that FSC pickups do everything. No pickup does. But they get around the problem with a lot of modern pickups, which tend to be too middle-of-the-road. You wouldn’t use the same gear to play Muddy Waters that you would to play Slipknot. My palate runs from early electric blues like Howlin’ Wolf to the Beatles to U2 and Smashing Pumpkins. I have found that hand-wound pickups work perfect for all of these styles. I love the Buzzcocks, The Police, and Nirvana. I love Curtis Mayfield and Sly Stone. I grew up hearing the Band, Bob Dylan, Bowie, and Hendrix. You’ll find PJ Harvey in our record collection along with Gang of Four. FSC ‘59s can walk me through all of these eras of tone. You may need something different from the FSC ‘59s when you start dealing with massive amounts of gain. The tones of Avenged Sevenfold, Pantera, and other genres of metal require a very specific and different setup. But for all the classic sounds, hand-wounds are your friend. Each of the following examples include options for clean DI (straight in) comparisons, reamped through amps, and miked with an AEA A840 ribbon into a UAD Apollo with a Neve 1073 preamp. I’ve also included examples using UAD amp sims, as this has become a regular tool for a lot of home recordists. For most of these examples I did not add any EQ or processing. This was intentional, so you can hear minute differences without the influence of anything else. Some examples I treated as if I were making a record. These are be labeled with signal chain. DI electric guitar is one of my least favorite sounds. The point of these examples isn’t so much to get a pleasing tone. It’s to hear at the most basic level any changes to tone. I didn’t want any amps or pedals coloring the tone. What’s interesting to me is that I heard the difference in pickups in every example and always preferred the FSC 59’s. Let’s see what you think. 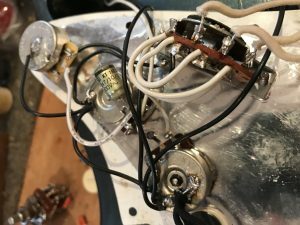 Strat with FSC ‘59s into a Effectrode Mercury Tube Fuzz into an Effectrode Tube Drive into Korg SDD-3000 delay into a Headstrong Lil King Reverb. Additional reverb coming from the UAD Lexicon 224 Digital reverb plugin. 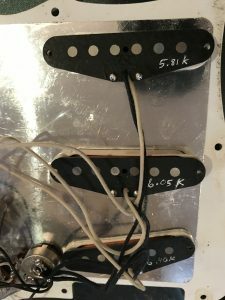 I hope at minimum this article gives you an idea of the difference pickups can make to your guitar sound. It’s not the easiest component to experiment with, but the results can be game changing.